From the Departments of Clinical Neurological Sciences (V.C., D.D.K., S.F., M.B., L.A.S.) and Pathology and Laboratory Medicine (L.A.S. ), London Health Sciences Centre, Departments of Anatomy and Cell Biology (Q.Z.) and Epidemiology and Biostatistics (L.A.S. ), Schulich School of Medicine, and Dentistry, Stroke, Dementia, and Heart Disease Lab (L.A.S.) and Robarts Research Institute (L.A.S. ), Western University, London, Canada. Retrograde embolization from the descending aorta is an underrecognized mechanism of ischemic stroke. A donut sign, defined as a filling defect within the arterial lumen, completely surrounded by contrast on 2 contiguous axial source images in the descending aorta indicates intraluminal thrombus with the potential to cause a stroke. Administration of IV tissue plasminogen activator (tPA) in patients with aortic dissection can lead to aortic rupture and death. Routine CT angiogram of the extracranial vessels including the aortic arch is not supported by current acute stroke treatment guidelines but may be needed in case of a high clinical suspicion of aortic dissection. A 65-year-old woman presented with sudden-onset global aphasia and right-sided hemiplegia (NIH Stroke Scale score 22). She arrived to the hospital 1 hour and 55 minutes after symptoms onset. Her medical history was relevant for hypertension, idiopathic deep vein thrombosis (treated with apixaban for 3 months, 1 year earlier), smoking, and obesity. She was not on antiplatelet or anticoagulant therapy. Initial CT of the head showed early ischemic changes in the left insular ribbon and caudate head. A CT angiogram of the head showed an occluded left middle cerebral artery (MCA) with potentially reversible ischemia on CT perfusion imaging. A CT angiogram of the neck evidenced a 6.8 cm linear hypodensity extending distally from the proximal descending aorta, 39 mm away from the origin of the left common carotid artery (figure, A). On axial imaging, the appearance was that of the donut sign. (A) CT angiogram of the neck shows a thrombus (giant donut sign) in the descending aorta. (B) A nonocclusive elongated thrombus (approximately 6.8 cm) arises from a complex eccentric thrombus/plaque in the proximal descending aorta with propagation to the mid descending aorta. (C) Left middle cerebral artery sample retrieved from mechanical thrombectomy. (D) The sample is an organizing blood clot with laminations consisting of neutrophils and fibrin. In discussion with the neuroradiologist, a CT angiogram of the chest, abdomen, and pelvis was done because of the suspicion of a type B aortic dissection. IV recombinant tPA was withheld because of the elevated risk of aortic rupture and death in the context of uncertainty about a potential aortic dissection. After CT angiogram of the chest, abdomen, and pelvis, an aortic dissection could not be definitely ruled out by the neuroradiologist. Thus, the stroke team was advised to consult a body cross-sectional radiologist, who subsequently consulted a vascular radiologist due to difficulty in image interpretation. Approximately 2 hours later, it was concluded that there was no aortic dissection, and that there was a fresh nonocclusive thrombus within the proximal aortic arch arising from a complex eccentric plaque. There was also a nonocclusive thrombus in the right proximal superior femoral artery. By the time we received a definite report, the patient was already undergoing a mechanical endovascular thrombectomy, which was successful, with reperfusion (thrombolysis in cerebral infarction IIB) at 4 hours after symptoms onset. IV thrombolysis was not given. The patient was started on IV heparin 24 hours after the mechanical thrombectomy with no evidence of subsequent symptomatic intracerebral hemorrhage or new peripheral embolism during follow-up. The IV heparin was transitioned to dalteparin (200 units/kg) on day 10, and subsequently switched to warfarin at day 14 poststroke. A repeat CT angiogram of the chest 2 months later showed almost complete resolution of the thrombus in the descending aorta. The patient went to an inpatient rehabilitation program poststroke, and later moved into a nursing home with severe residual right-sided weakness and some improvement in her aphasia. Stroke investigations in hospital showed a normal transthoracic echocardiogram with trace aortic regurgitation, no arrhythmias on cardiac telemetry, no significant stenosis of the extracranial or intracranial arteries, and a negative thrombophilia screen (antiphospholipid, lupus anticoagulant, antithrombin, protein C and S, activated protein C). The pathology of the left MCA sample (figure, C) was an organized blood clot with laminations consisting of neutrophils and fibrin (figure, D). In the absence of any other clear etiology, the cause of stroke was determined to be retrograde embolism from the descending aortic thrombus. Three learning aspects of this clinical case are worth mentioning: retrograde aortic arch embolization as a stroke mechanism, the risk of IV thrombolysis in patients with aortic dissection, and the importance of the aortic donut sign as a tomographic indicator of the presence of an intraluminal aortic thrombus. This case highlights the role of descending aortic thrombus causing retrograde embolization as an unusual and likely underestimated stroke mechanism. The large size, mobile, and fresh aspect of the thrombus in the context of concomitant peripheral embolization further supports this pathophysiologic mechanism. While right-handed helical flows are predominant during late systole in the aortic arch, end-systolic retrograde flow occurs along the inner wall of the aorta in all patients.1 This retrograde flow from complex descending aortic plaques has the ability to reach all 3 supra-aortic vessels that supply the brain, thus making retrograde embolism a plausible mechanism for stroke.2 The vessels supplying the left side of the brain are the first ones to be reached by emboli arising from descending aorta plaques or thrombus. As such, the left subclavian artery (58.5%) is the most common vessel, followed by the left common carotid artery (24.5%), and the brachiocephalic trunk (13.8%).3 Retrograde embolism is the only probable source for ischemic stroke in up to 24% of patients labeled with cryptogenic stroke, and constitutes an alternative source for stroke in 33% of patients with an established stroke etiology.2 Currently, limited evidence exists to guide secondary stroke prevention in patients with retrograde aortic embolization. 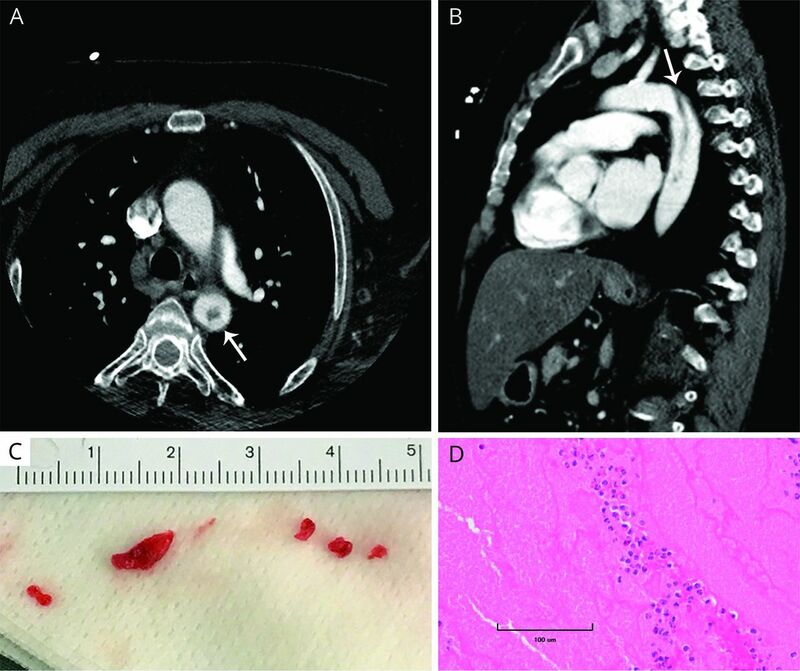 Chhabra et al.4 described a case of suspected retrograde embolism from an atheroma in the descending thoracic aorta in a patient with multiple old bilateral infarcts and a new pontine infarct that prompted admission. This patient was on dual antiplatelet (aspirin and clopidogrel) prior to admission due to a recent TIA and was switched to warfarin and aspirin with no recurrence of stroke on a 2-year follow-up. In the absence of randomized controlled trials, the type and duration of antithrombotic therapy (antiplatelet vs anticoagulant therapy) used for secondary stroke prevention should be decided on a case by case basis. Some patients may have a secondary indication for anticoagulation based on an underlying hypercoagulable disorder to guide treatment decisions. The donut sign has been reported in patients with reversible intraluminal carotid thrombus, mostly in association with atherosclerotic plaque, but also in relation with internal carotid artery dissection, carotid endarterectomy, and left ventricular thrombus.9 The presence of the donut sign has been associated with a high risk of embolization. When assessing our patient, we were familiar with the carotid donut sign but we were not aware of any report of an aortic donut sign. Knowledge about prior reports of this aortic CT angiogram finding may have helped us to expedite the final diagnosis, although a dissection as a cause of the thrombus would have still been difficult to rule out. Awareness about this filling defect within the aortic lumen, completely surrounded by contrast on at least 2 contiguous axial source images, should aid in the etiologic diagnosis and possibly in the management of hyperacute ischemic stroke. Dr. Choi: reviewed the case, drafted the first manuscript, reviewed the final version of the manuscript for intellectual content. Dr. Kim: reviewed the case, edited the manuscript, reviewed the manuscript for intellectual content. Dr. Fridman: reviewed the case, edited the manuscript, reviewed the manuscript for intellectual content. Dr. Zhang: reviewed the case, edited the manuscript, reviewed the manuscript for intellectual content. Dr. Boulton: reviewed the case, edited the manuscript, reviewed the manuscript for intellectual content. Dr. Sposato: reviewed the case, edited the manuscript, reviewed the manuscript for intellectual content. L.S. is supported by the Kathleen & Dr Henry Barnett Research Chair in Stroke Research (Western University, London, Canada); the Edward and Alma Saraydar Neurosciences Fund (London Health Sciences Foundation, London, Canada); and the Opportunities Fund of the Academic Health Sciences Centre Alternative Funding Plan of the Academic Medical Organization of Southwestern Ontario (AMOSO) (Ontario, Canada). V. Choi, D. Dongkyung Kim, S. Fridman, Q. Zhang, and M. Boulton report no disclosures relevant to the manuscript. L. Sposato reports speaker honoraria from Boehringer Ingelheim and Pfizer and research grants from Boehringer Ingelheim. Go to Neurology.org/N for full disclosures.
. Helical and retrograde secondary flow patterns in the aortic arch studied by three-directional magnetic resonance velocity mapping. Circulation 1993;88:2235–2247.
. Complex plaques in the proximal descending aorta: an underestimated embolic source of stroke. Stroke 2010;41:1145–1150.
. Identification of painless aortic dissection before thrombolytic treatment for acute ischemic stroke. Am J Emerg Med 2013;31:762–766.
. Retrograde embolism from the descending thoracic aorta causing stroke: an underappreciated clinical condition. Indian Heart J 2013;65:319–322.
. Guidelines for the early management of patients with acute ischemic stroke: a guideline for healthcare professionals from the American Heart Association/American Stroke Association. Stroke 2018;49:e46–e110.
. Canadian stroke best practice recommendations: acute inpatient stroke care guidelines, update 2015. Int J Stroke 2016;11:239–252.
. Acute aortic dissection complicated by acute ischemic stroke: diagnostic challenges. Am J Emerg Med 2012;30:2070–2073.
. Does this patient have an acute thoracic aortic dissection? JAMA 2002;287:2262–2272.
. The donut sign on CT angiography: an indicator of reversible intraluminal carotid thrombus? Neuroradiology 2010;52:1055–1056.